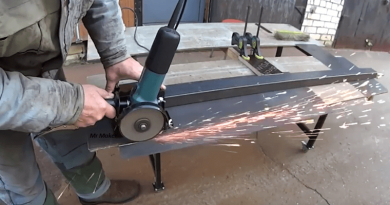 Craft Your Own Sturdy Angle Grinder Support From Metal Scrap. If you’re a DIY-er or just fond of doing metalworks, chances are you’ve experienced using angle grinders, but ended up cutting metals incorrectly. It would be helpful if you’ll be able to build an angle grinder stand that can support your cut metals perfectly. The process starts with preparing and drilling some necessary parts of the base of the stand. The angle grinder will be placed on top of a metal scrap that will be supported by a spring and a clamp hose. At the base, another metal scrap will be placed to act as a stopper. A c-clamp is also used to facilitate a flawless cut. Watch the video to see the steps in creating a DIY angle grinder stand. You’ll be able to observe the process from forming the base to setting up the angle grinder in place. You’ll also witness the tool in action, along with the reliability of the angle grinder stand. Move on to the Next Page video: Homemade Angle Grinder Stand. ← [Video] Build Your Own Wall Mounted Desk With Everyday Garage Materials. Did this person actually read the manual for the angle grinder. I have several and about half of the manual is safety related warnings to discourage doing something like this! Have you ever seen a cutting or grinding wheel come apart? I have. I am a Maintenance mechanic for a fortune 100 company and have seen things go badly by improperly using power tools. Should someone construct a home made chop saw as encouraged by the video and have shrapnel pulled out of their face in the ER, a personal injury lawyer would have a field day! The trip to the ER will cost more than buying a cut-off saw designed for this purpose. Some of these ideas are accidents waiting to happen. Is loosing an eye really worth saving $100? Even a $50 cut off saw from HF is safer and would perform better than this contraption!